It turns out ABC's never before seen O.J. Simpson tapes have been seen before. On Friday, ABC News issued a public apology for wrongly promoting "never before seen" tapes from Simpson's deposition in the 1997 civil suit over the killings of Nicole Brown Simpson and Ron Goldman. "We were wrongly under the impression these deposition tapes were exclusive and had not aired before at length," an ABC News spokesperson said in a statement. "We learned this morning portions did air 15 years ago. We apologize for the mistake." The tapes in question first aired on NBC's "Dateline" in 1999, and again in 2004 and 2014. Nevertheless, ABC has been promoting a 20/20 "exclusive" set to air on Oct. 9 that will feature the the "missing tapes" for "the first time." "It's hard to believe that all this sat for 20 years," Elizabeth Vargas, the ABC News anchor who led the reporting on the special, says in the 20-second promo. Vargas also appeared on ABC's "Good Morning America" on Friday to promote the special, where co-host George Stephanopoulos described the tapes as "never seen before. His co-host Robin Roberts also tweeted, "@EVargasABC is @GMA w/ a preview of her @ABC2020 exclusive, never before seen tapes of OJ Simpson in his own words about his wife's death." NBC's "Dateline" took issue with those claims on Friday morning. "Oh, hey @abc2020 @GMA partying like it's 1999! Check out #Dateline logo from first time we aired the tapes!" it wrote on Twitter, with the hashtag #retro. "Dateline" correspondent Josh Mankiewicz also took a shot at ABC, tweeting: "Tonight, @abc2020 is promoting a show about the "lost" OJ Simpson tapes. 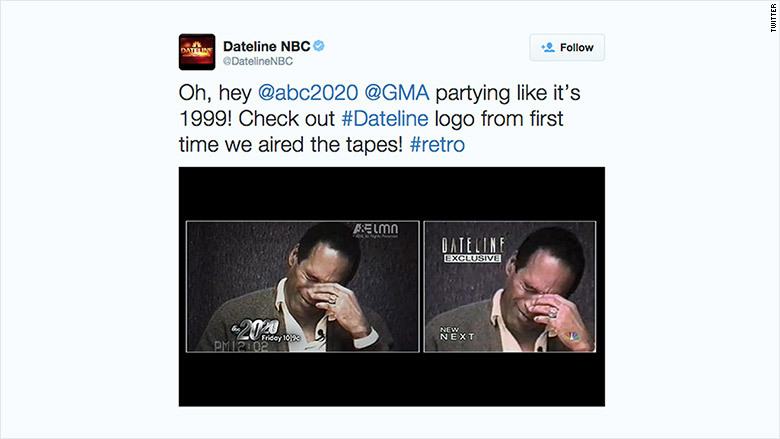 Uh...Dateline already aired them, in 1999 and again in 2014." If ABC's error rankled NBC, it may be because it's not the first time ABC has trumpeted an exclusive that turned out to be anything but. Earlier this week, the network trumpeted a World News "exclusive" interview with Martin Shkreli, the CEO of Turing Pharmaceuticals. Never mind that he also appeared on both NBC and CBS.